BUOYANCY: The Helix tiers buoyancy 5-5-4, centralizing the core to raise the position of the hips in relation to the rest of the swimmer. The Helix uses two layered chest panels that naturally and anatomically accentuate the lungs in producing the optimal amount of buoyancy for the swimmer in the upper body. 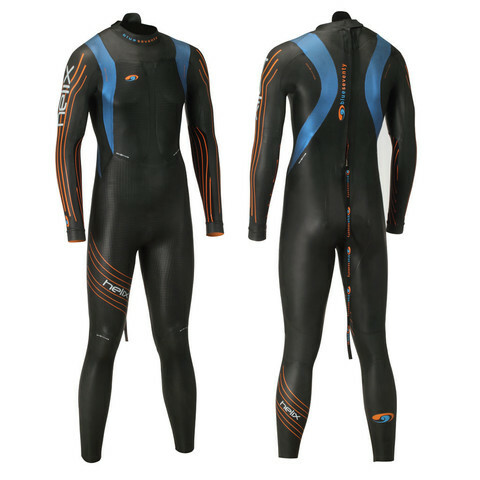 The torso uses a core panel of Yamamoto Aerodome material to deliver a maximal central buoyancy zone in the suit, keeping the hips high and promoting an efficient downhill swimming position. Research with top swimmers has shown that our 4mm Yamamoto 39 cell neoprene legs deliver the perfect blend of buoyancy without limiting drive from the kick. A Double layer sandwich construction in the chest panels improves buoyancy while promoting chest expansion. The external panel of the Helix chest is a single external 1.5mm high flex sheet, which allows the chest to naturally expand to promote more efficient respiration. 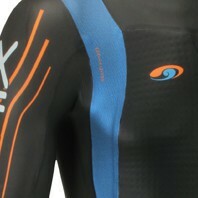 Orange A-Flex inner jersey is laminated to ultra supple 40 cell neoprene to produce an incredibly flexible suit. A-FLEX material is used in our worlds first 1mm arms, oversized 1mm arm gussets, 1.5mm TST panels, and 2mm back panel resulting in un-paralleled freedom of movement. Torsional Stretch technology has been a standout feature of the Helix suits since the first model was released in 2005. The new Helix TST panels are further enhanced with functional design using A-FLEX material in a swim specific multidirectional layout. Our now legendary reverse zipper not only ensures a more sure swim, and a quicker suit exit, but reduce the need for a traditionally bulky collar improving your comfort, and making it easier to sight. The A-FLEX 4 way stretch fabric in our 1mm cuffs wrap around the wrist to seal the arms from water entry, without catching when taking the suit off. Another world first; our ultra light, diaphanous AQUA FEEL forearms are made with a permeable NeroTX fabric allowing the swimmer to feel the water through the suit. An increased awareness for the position of the arm in the water encourages better technique, greater power and reduces the risk of injury. Our 2 mm textured KNEE FLEX panels assist with knee flexion by reducing bunching behind the knee and improve functionality when you need to run to T1. Our tube construction in the lower leg, combines A FLEX material with a single seam to maximize the flexibility and promote a quick release from your suit in the transition. Liquid taping on the internal seam reinforces and allows you to cut the leg to your desired height. The products of our store are the perfect combination of a real reliability and durability. We assure you that our goods have a great number of advantages and it is very important for the customers. Our products are the real best sellers because they have numerous devoted clients all over the country and as you know - those positive testimonials are the best advertising. This fact proves that our company takes the leading place among the competing ones. We observe only branded commodities policy. You can buy the premium quality goods at a fair price.